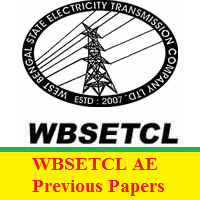 The subject wise WBSETCL AE Previous Papers PDF links are available in this article for the sake of applicants. So, candidates can check this article until the end and gather complete details about wbsetcl.in Junior Executive Old Papers along with the WBSETCL Exam Pattern. Applicants can download the WBSETCL AE Previous Year Question Papers and start your preparation for the Assistant Engineer, Assistant Manager, Junior Executive Exam now onwards. Mostly, the officers of the West Bengal State Electricity Transmission Company Limited (WBSETCL) are ready to conduct the test in February 2019. Therefore, applicants don’t waste your valuable time searching WBSETCL AE, JE, AM Question Papers on various sites on the Internet. Check this article and get the latest updates about WBSETCL Assistant Engineer Selection Process as well as the direct links to download the WBSETCL Assistant Engineer Previous Papers. In case of two or more candidates scoring equal marks (combined), the candidate senior in age will be given preference. If the aggregate/ combined marks and also the date of birth be the same, the candidate scoring higher in online examination will be given preference. All the selected candidates must also qualify in the Pre-employment Medical Examination as per the prescribed rules of the Company. The decision of WBSETCL pertaining to Pre-Employment Medical Test report will be final and binding on the candidate. So, candidates must and should refer to the WBSETCL Exam Pattern 2019 from the below table. And by this, you can get all the related information to start preparing for the exam. Moreover, there is no negative marking. There will be no qualifying marks for the Interview. However, the marks secured in the Interview will be added during the time of preparation of the Final Merit List. For all the notified posts, a candidate will have to score a minimum of 05 (five) out of allotted 20 (twenty) marks to qualify. Are you in search for the wbsetcl.in Junior Executive Old Papers in various sites on the Internet? Then stop your looking and check this article once. For the sake of applicants only, we had prepared this post with more information about the WBSETCL AE Previous Year Question Papers along with the exam pattern, the WBSETCL Assistant Engineer Selection Process. Enhance your skills by more and more practice of the Sample Papers. At the time of preparation, candidates can take the help of WBSETCL Exam Pattern. Because, without knowing the WBSETCL Test Pattern, candidates cannot prepare well for the WBSETCL Written Exam 2019. So, candidates must and should refer to the entire page and download the subject wise WBSETCL AE Previous Papers in PDF format for free of cost. So, we hope all the candidates will start preparing the problems given in the WBSETCL Assistant Manager Model Papers. FreshersNow.Com is the single destination, where you can find the most essential updated information. So, candidates can find out the exact WBSETCL Exam Date, and the sample WBSETCL AE Previous Papers from this article by subscribing us.